This oil painting by Carl Barks is titled ‘Halloween in Duckburg’. 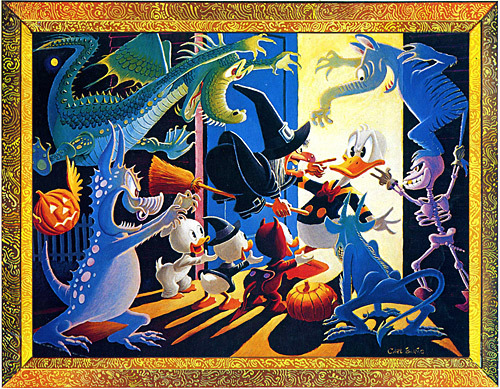 The 1973 painting is based on the cover of Donald Duck 26, which featured Barks’ story ‘Trick or Treat’ in which Huey, Dewey & Louie team up with a real witch named Hazel to get treats from Donald on Halloween. The above picture is a scan from the back of issue 3 from 1992 of Dutch Donald Duck Extra, which for a few years printed Barks’ paintings on the back of each issue. This entry was posted on Sunday, October 31st, 2010 at 12:01 am	and is filed under Carl Barks. You can follow any responses to this entry through the RSS 2.0 feed. You can leave a response, or trackback from your own site.